Halloooo! How is this November weather treating everyone? It was the first night of a deep FREEZE last night for my town and mind you I live in the desert so we don’t see too many of these. BRRRRR! So I’m all snuggledy-wuggledy in warm clothes and blankets today. And what is my favorite thing to do when it is cold outside? Yup. You guessed it. READ! And now I will be reviewing a fantastic book I just devoured. I just recently read a phenomenal book by a phenomenal author. It is called NINETY-FIVE PERCENT HUMAN and was written by Suzanna Williams (one of my favorites!) The story starts out on a rural farm from the perspective of a young man named Joe. With his parents no longer in the picture and his grandma and brother the only family he has left, Joe is stricken with the hard decision of sacrificing his youthful opportunities to fix up and work on the dilapidated farm or to sell it and let go of a history of life-long memories and hard work. Just as he struggles with these obstacles, a mysterious girl named Sarah shows up and Joe is forced to save her from drowning in the lake on his farm. And from that point on things only become more curious and exciting, from car chases to exploding fires, from action to drama. Will Joe be able to handle all of the trouble thrown his way since Sarah showed up? Will Joe ever find out Sarah’s true purpose? This story is a science fiction thriller with a splash of romance. It leaves you on the edge of your seat and wanting more with every turn of the page. I loved it thoroughly and cannot wait until the sequel, Five percent alien comes out next year! Woo Hoo! This book is great for anyone of any age, although it sure has that youthful undertone that I love! 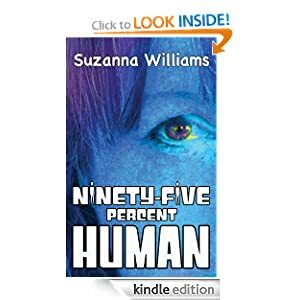 I give NINETY-FIVE PERCENT HUMAN by Suzanna Williams a fantastic 5 STARS! Get your copy here and snuggle in this winter with NINETY-FIVE PERCENT HUMAN! Thanks for the review. I’m so glad you liked Ninety-five percent. Didn’t know it froze in the desert!!!!!! We’ve not had any snow or even frost to speak of yet here in Wales but we’ve had crazy winds and torrential rain. Very odd weather.